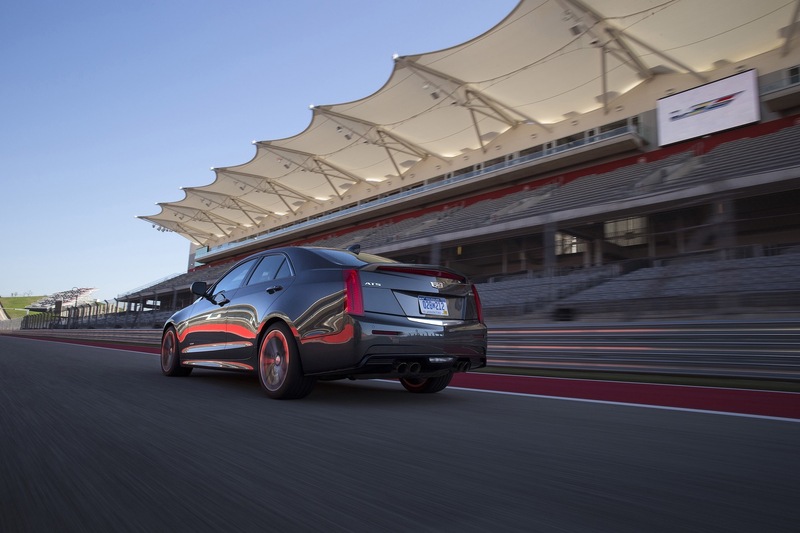 Cadillac is currently running an astounding lease deal on the 2016 ATS-V Sedan: for $559 per month and $4,649 down, you can lease the four door compact ultra high-performance luxury sedan. 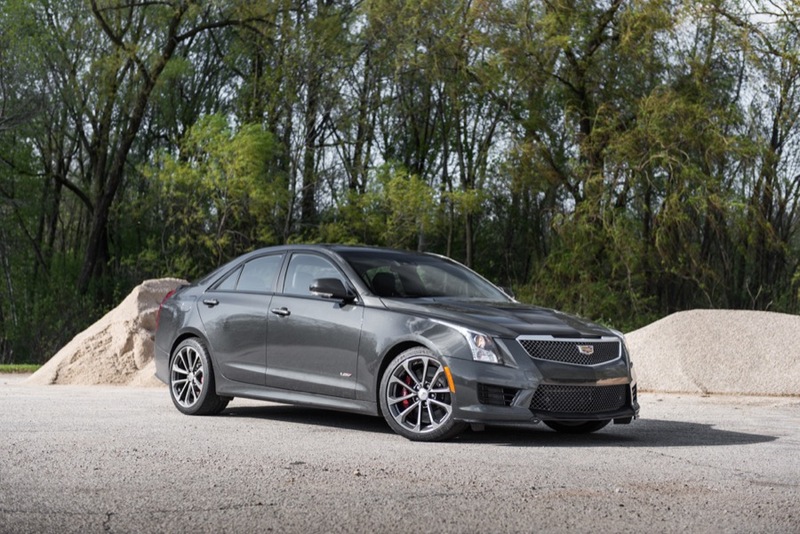 That much gets you a “base” ATS-V — the one without any optional packages like the $2,500 Luxury Package, $5,000 Carbon Fiber Package, or the $6,195 Track Performance Package. Still, that is a lot of car for the money. 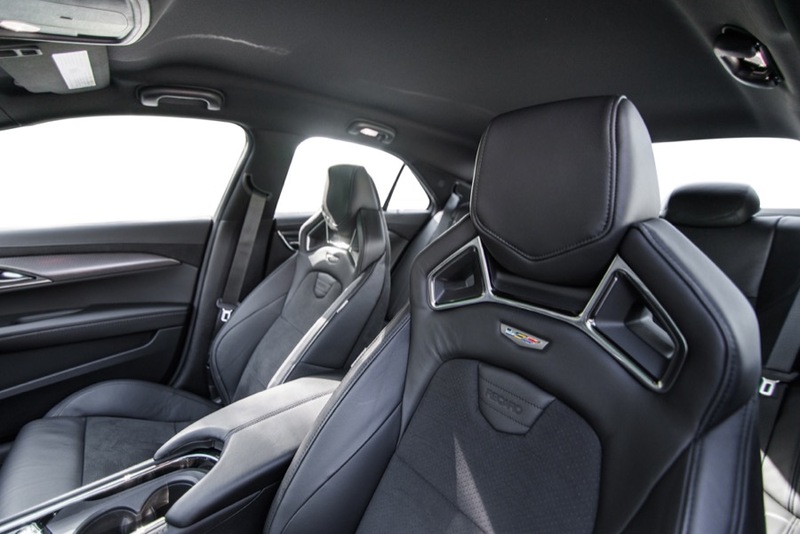 In case your memory is fuzzy on the ATS-V, we should note that the compact luxury rocket features a twin-turbo 3.6L V6 LF4 engine making 464 horsepower and 445 pound feet of torque capable of propelling the car from 0-60 mph in 3.8 seconds and attaining a top speed of 189 mph, while delivering perfect weight distribution and Magnetic Ride suspension capable of eating up curves better than most supercars. 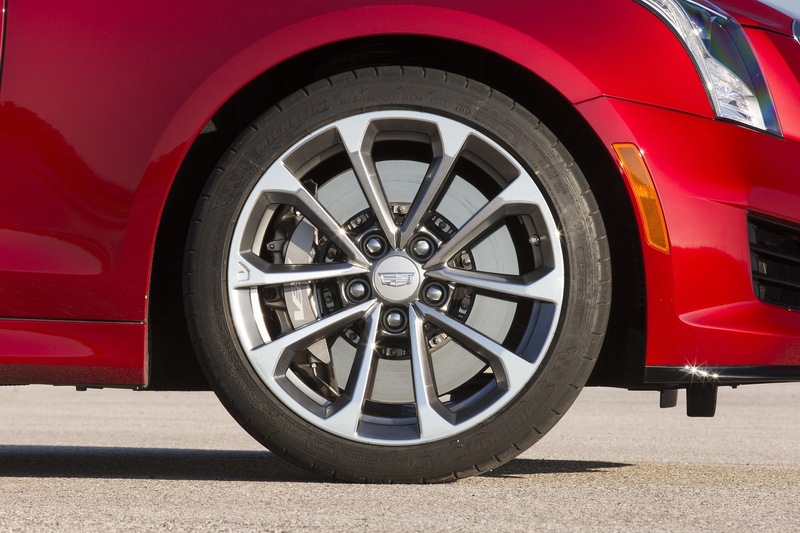 It also brings plenty of stopping power thanks to very capable Brembo brakes, aggressive yet refined exterior styling, and an overall experience deserving of the “luxury” moniker. To illustrate the incredible value, we should point out the fact that a BMW 340i sedan with the (admittedly attractive) M-Sport package leases for $549 a month and $4,474 down. 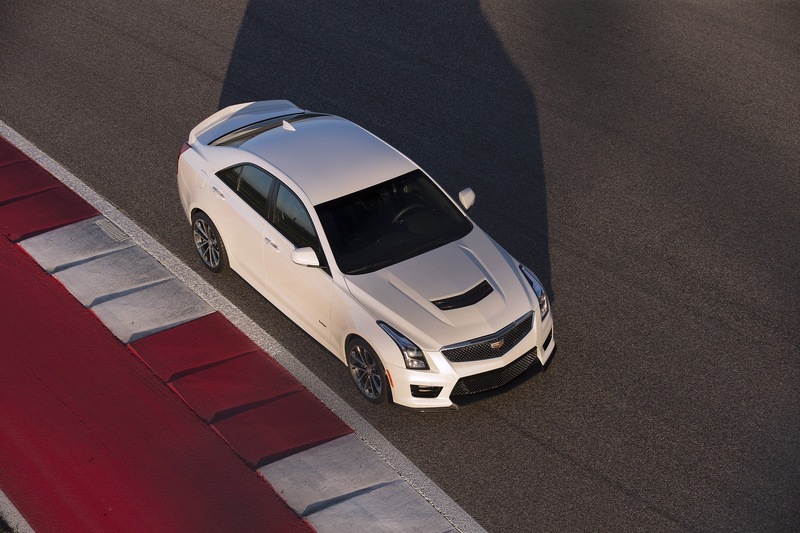 That’s $10 less per month for a vehicle that’s not even in the same league as the ATS-V. 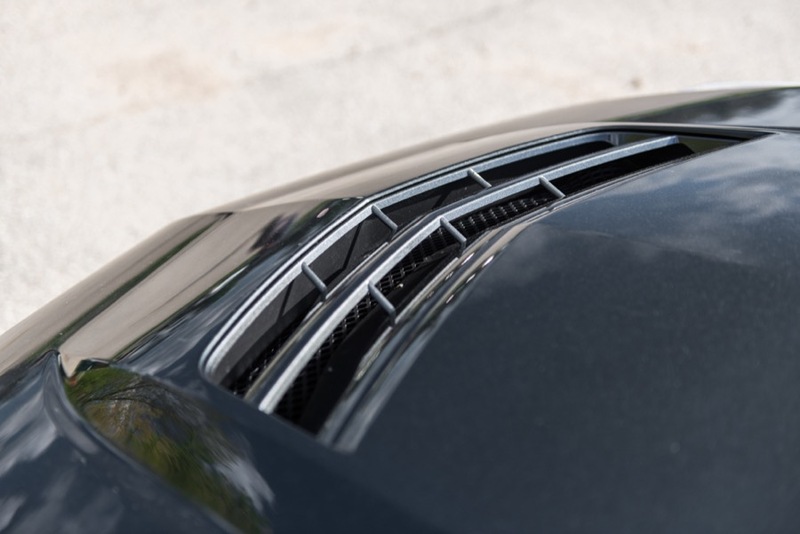 Instead, the 340i competes directly with the ATS 3.6, while the M3 is BMW’s rival to the ATS-V. And to lease an M3, be prepared to shell out $4,202 at signing and $777 a month thereafter. 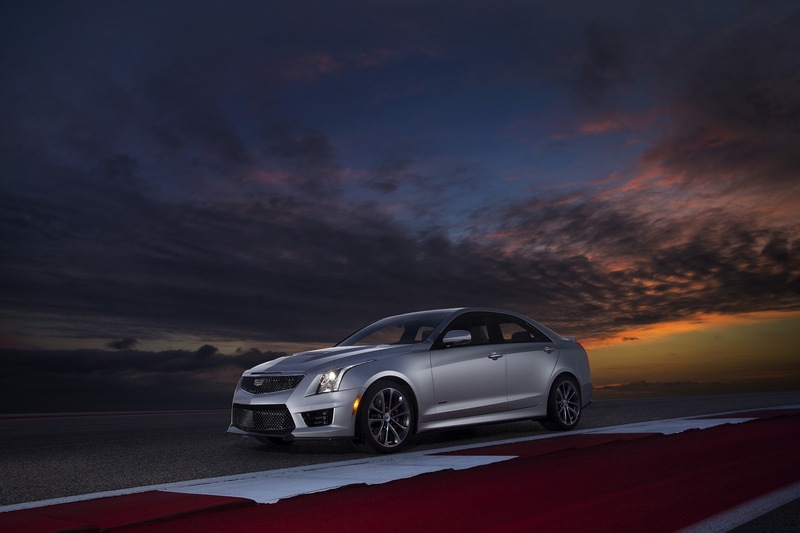 On a total expenditures basis (combining the initial downpayment and 36 monthly payments), it will cost $24,773 to lease the ATS-V Sedan for three years, and $32,174 to lease an M3 for the same period of time. When all is said and done, the BMW is $7,401 more expensive. 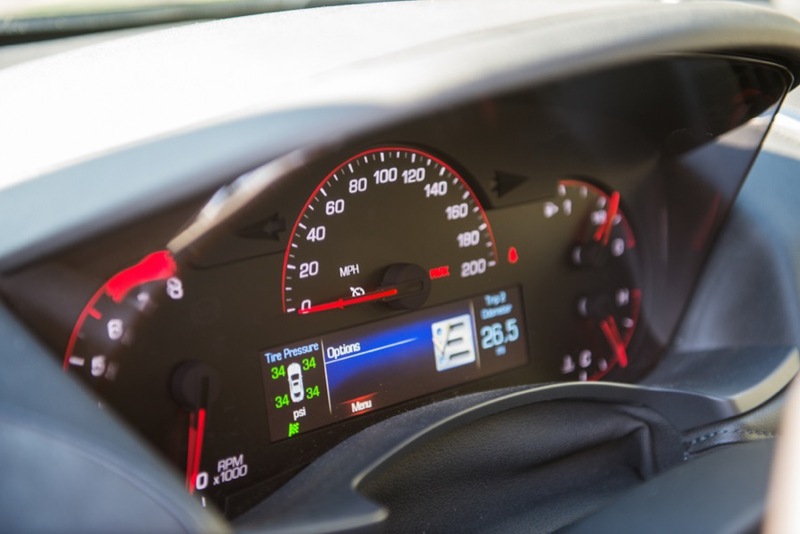 Granted, the figures stated here are for low-mileage leases of 10,000 miles per year that averages out to 830 miles per month, and those who expect to drive more can always increase the amount of miles allotted in the lease for an extra fee. 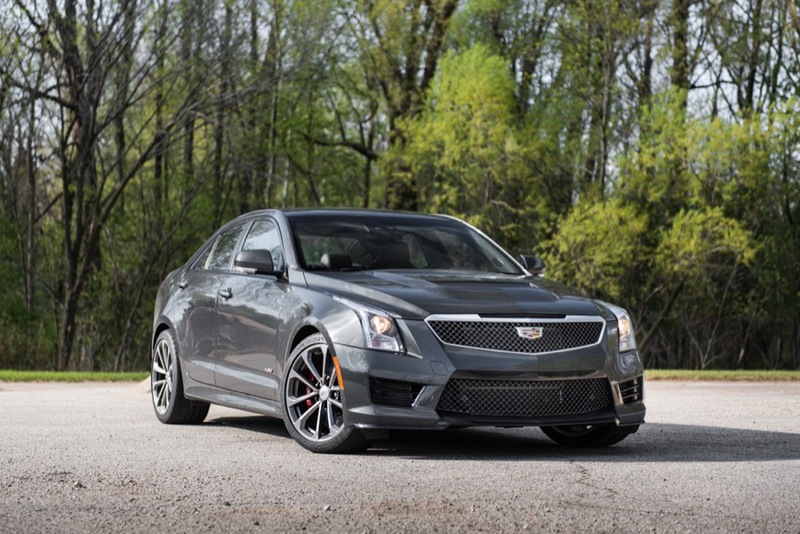 But the difference in price between the ATS-V and M3 is noteworthy given that a significant amount of luxury cars are leased, rather than bought (financed). 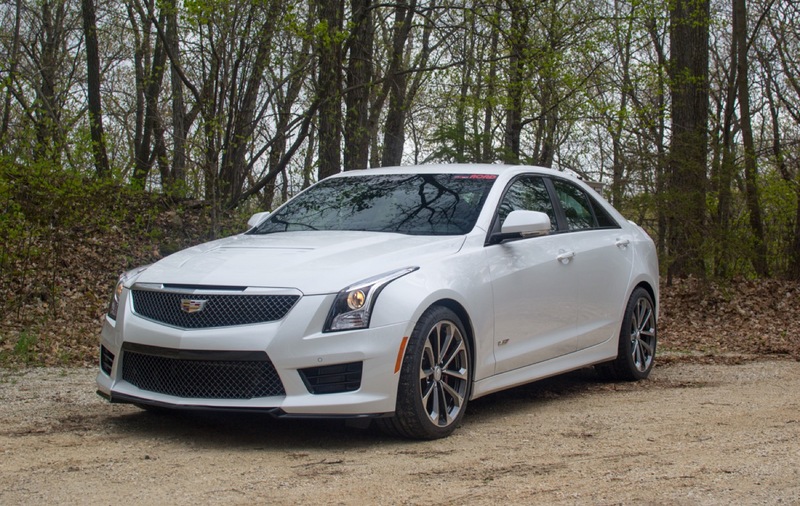 Those wondering about leasing the ATS-V Coupe should know that Cadillac doesn’t (yet) advertise an official lease program on the two-door monster, which is slightly more expensive than the ATS-V Sedan. Even so, we’re sure dealers will be able to put one together for those interested. Update: an earlier version of this story stated that the monthly payment of the “base” M3 is $784. While this is the case, the payment can be lowered to $777 by configuring the vehicle without an extra-cost exterior color. This story was updated to reflect the lower, $777 per month payment. 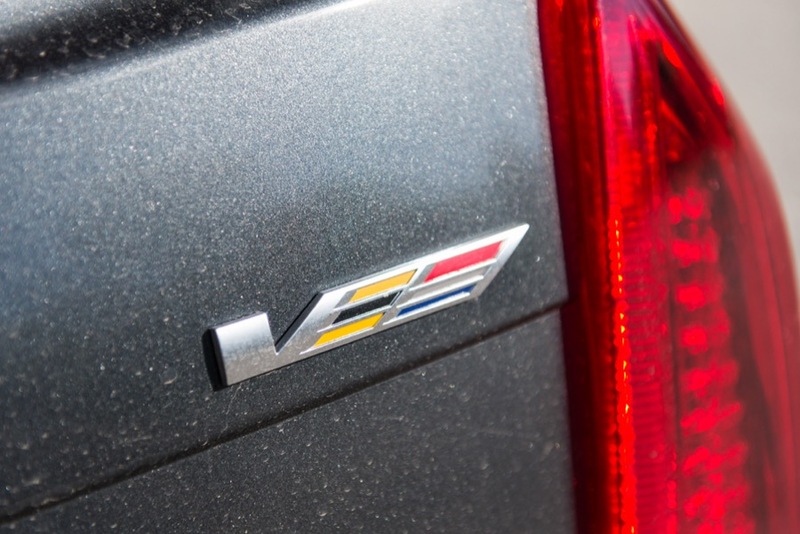 This Caddy is certainly awesome, but my Impala LTZ is a close alternative in quality and would be just as awesome with a comparable power train … even tho my 3.6 is no slouch either! Sorry cannot be comparing two vehicles in same breath. 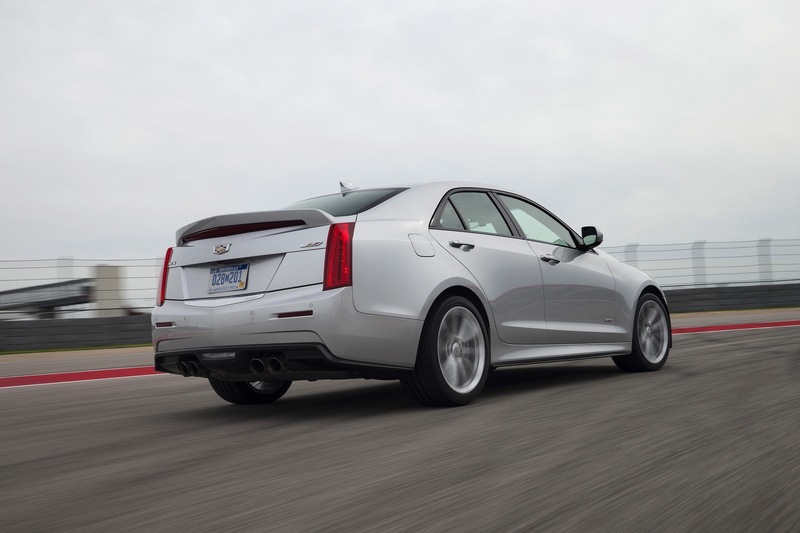 Cadillac is sport sedan and Impala LTZ. Pseudo luxury sedan. 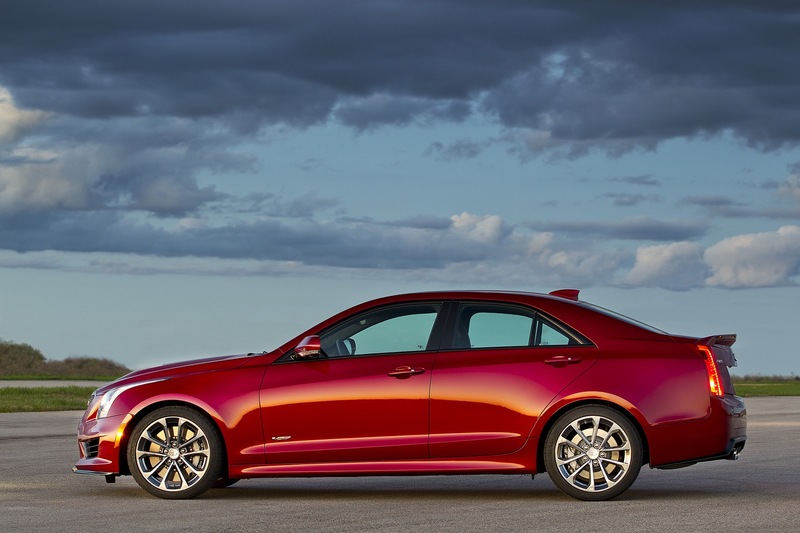 Even with a comparable powertrain the Impala, with it’s significant more mass, FWD bias and higher centre of gravity would not be ‘just as awesome’. 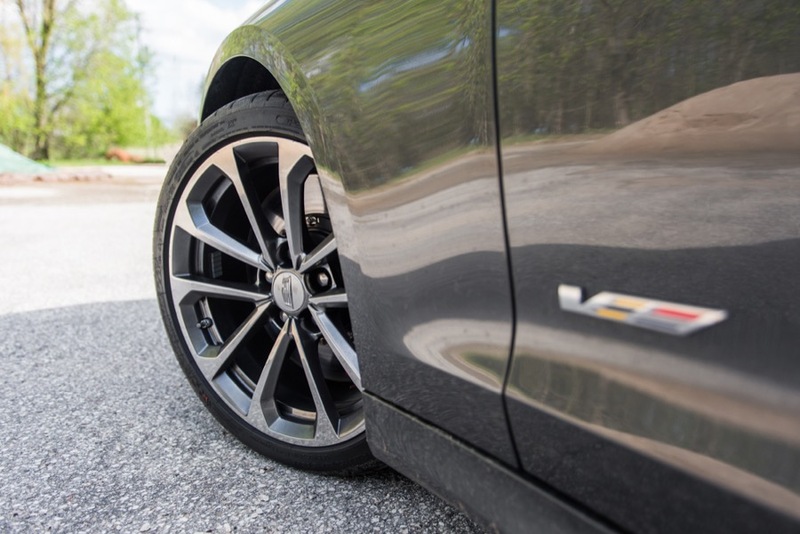 Although regretebly the Impala may likely be close in quality to the ATS. 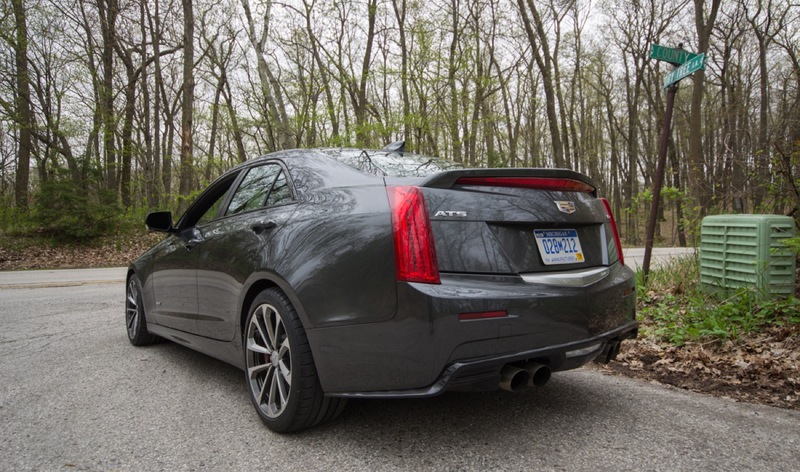 The ATS V may not have topped any performance luxury compact sedan comparos but it has not finished last as well. 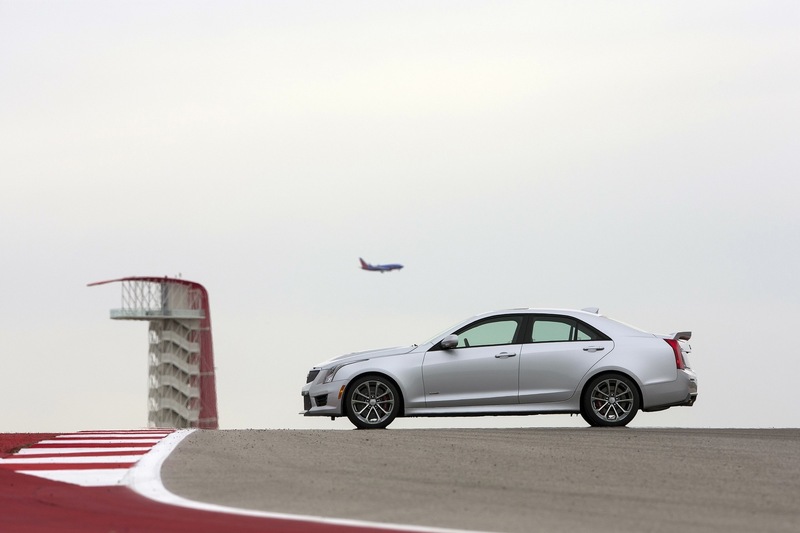 The main gripes against it were inherent to the regular ATS doner car and not V itself. 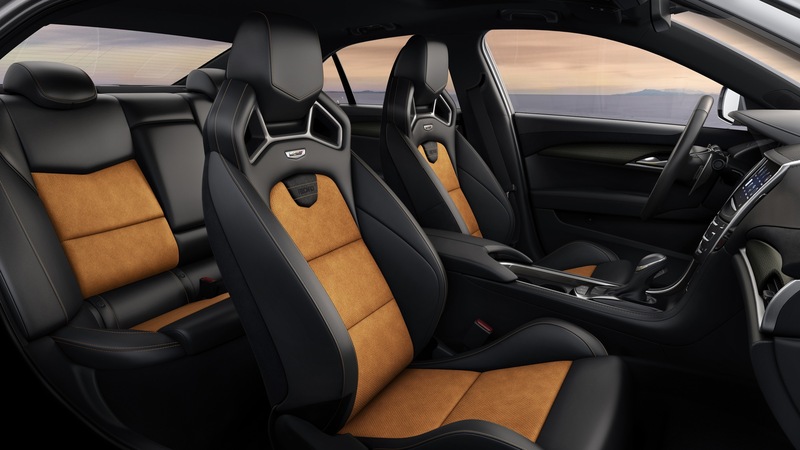 They got the performance right but the small interior, CUE and a less than premium powertrain seem to be the more consistent dings against it. Still not bad for a first attempt. Yes, the Impala is a very nice car (though I do wish Chevy increased the content on it to include features like a HUD, HIDs, etc.). 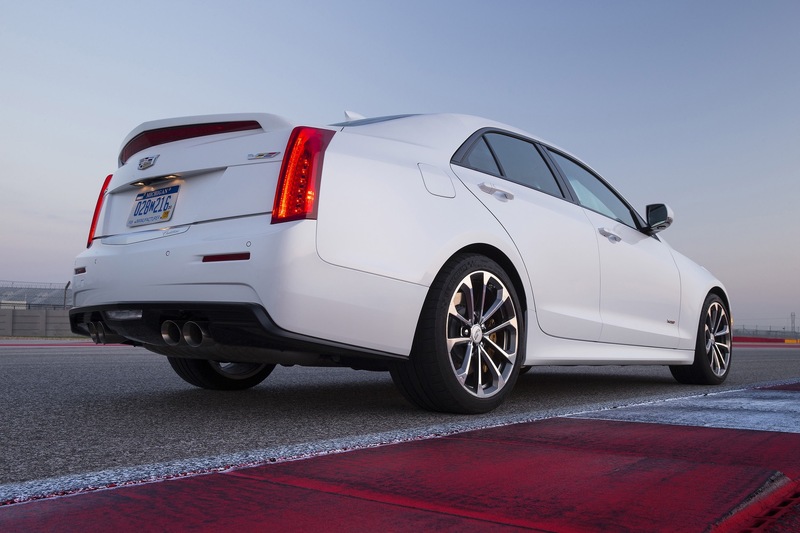 That said, the Impala LTZ with a twin-turbo V6 exists as the Cadillac XTS V-Sport. 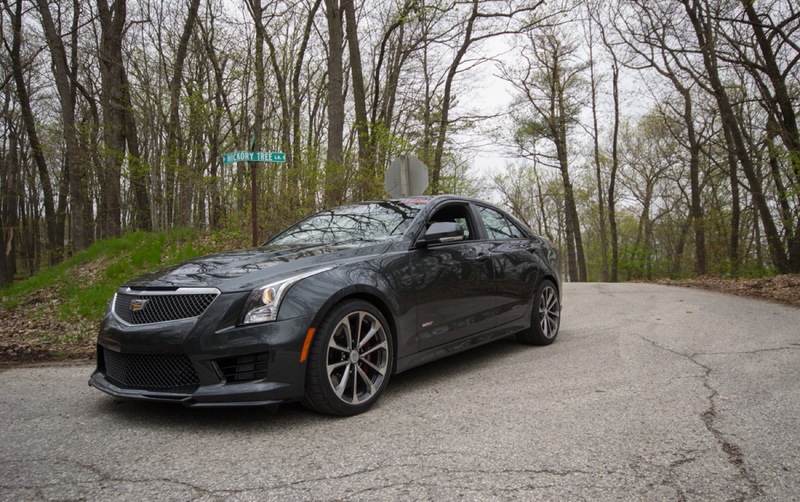 And though that is also a nice car, it is not in the same league as the ATS-V from a performance or capability standpoint due to its transverse engine orientation that leads to a less-than-ideal weight distribution. Still a better deal, if you like black interior. 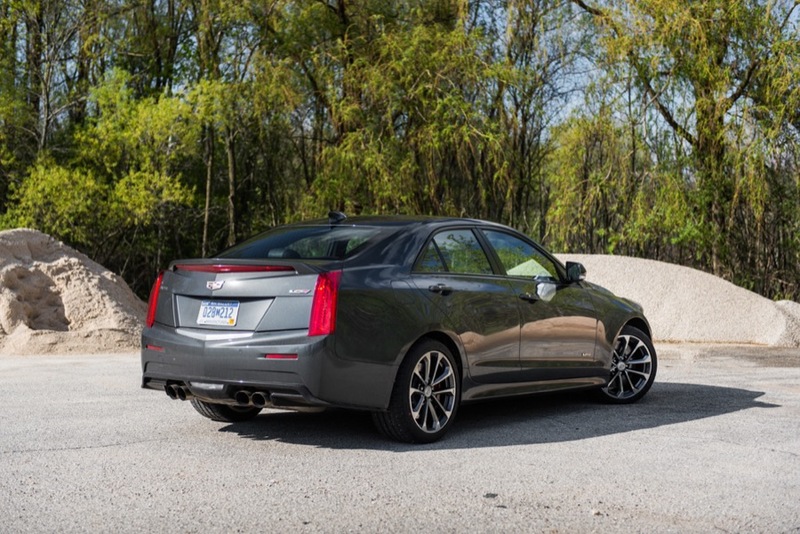 I see the best thing in all of this is keeping your eyes open for one of these leased Cadillacs to hit the used car lot . First . 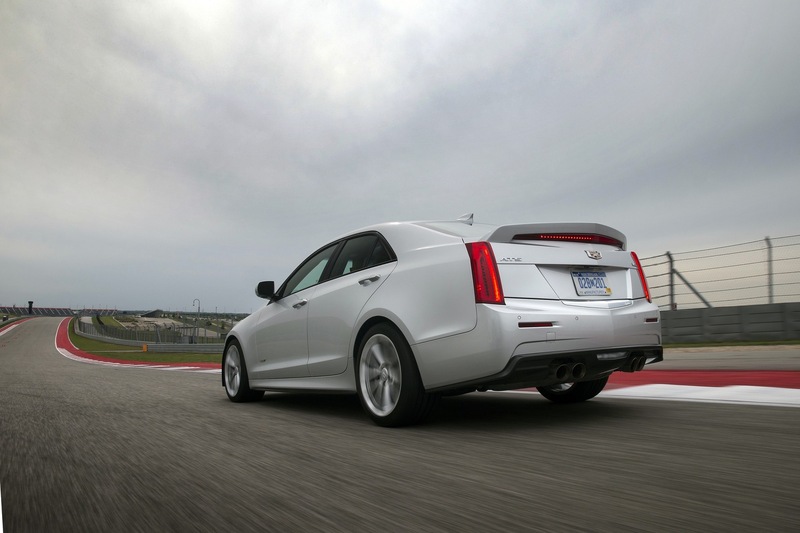 Leased Cadillacs need to be kept in very good condition so they can Certify the car after the lease has expired . Second , the car will have approx. 30 to 35,000 miles on it . 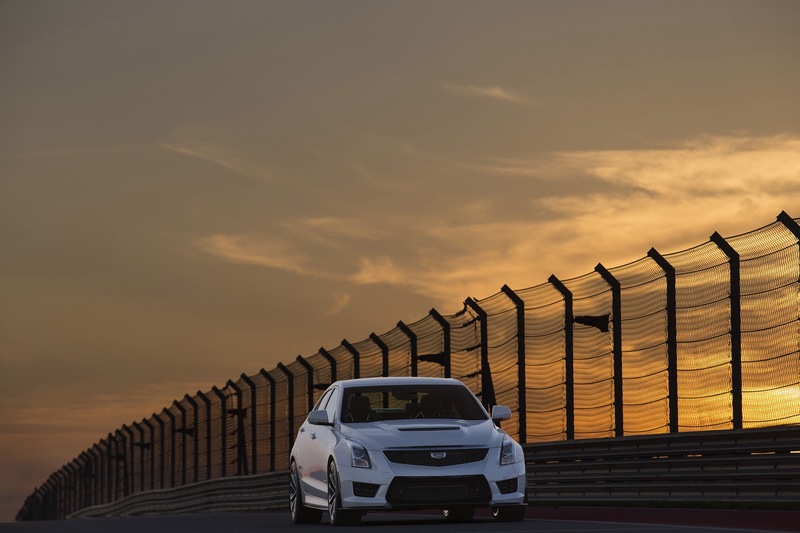 As long as it has less than 50,000 miles Cadillac will certify it with an extended warranty . Lastly , you get a very nice V that is barely used and at a much cheaper price . 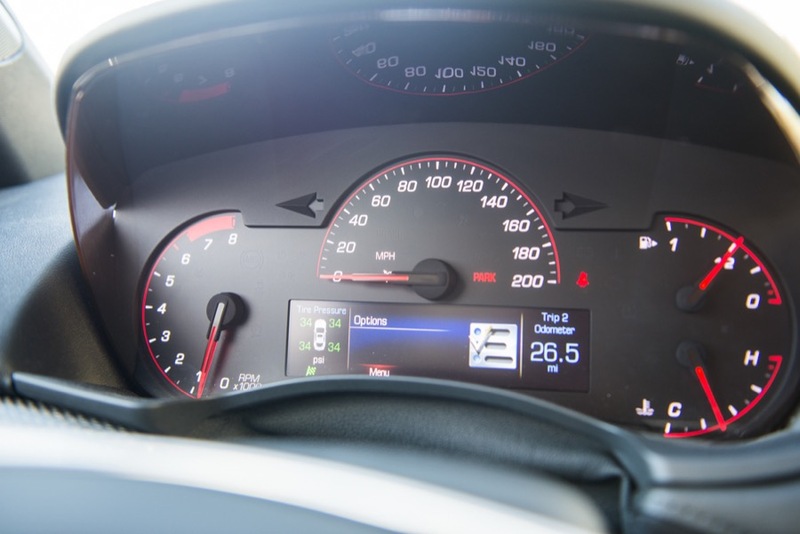 A win-win situation for both the initial owner and the second owner ..
A great used car value is all well and good but first people have to buy a new vehicle so it can get to the used market. Unfortunately for ATS there is not enough buyers right now. How does one define “enough”? How does one reach that conclusion? Sales are off from previous year while most competitors are just the opposite. 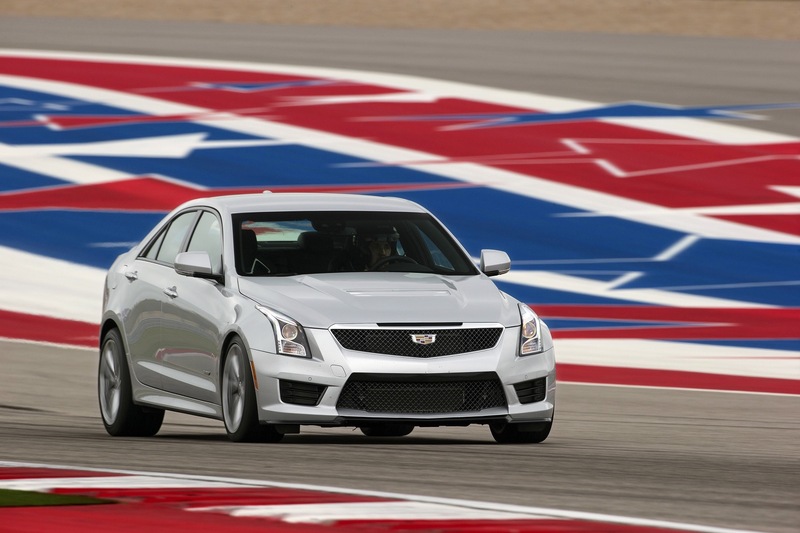 ATS sales volumes are declining year over year and have been since it’s introduction. I define not ‘enough’ as an inadequate amount required to realize a year over year sales volume increase. 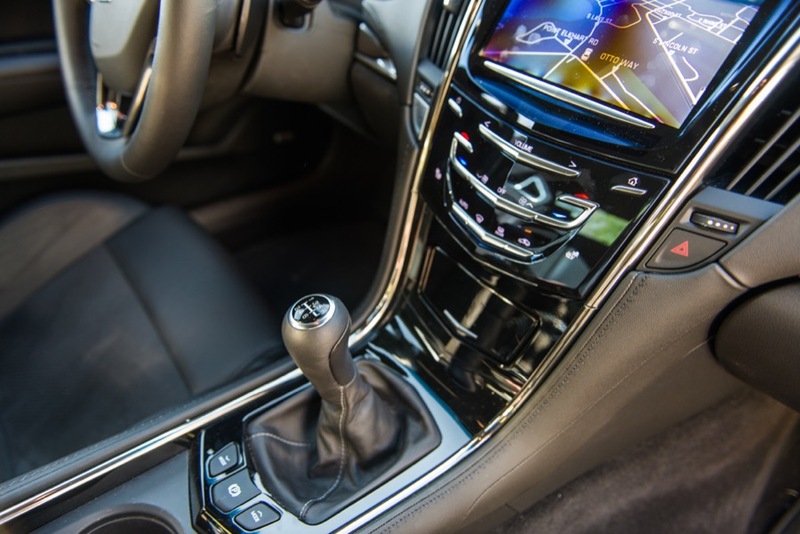 I appreciate that a significant percentage of ATS buyers are conquest sales however ATS sales in NA are 14.6% lower currently YTD compared to last year at this time meanwhile competitors like the TLX, 3 Series and C-Class have all posted year over year increases. Save for the 3er, every single one of those “competitors” you mention has been redesigned and is all-new within the last year, so obviously sales will grow on launch and revitalized interest. This is exactly what hapenned with the ATS. And while YOY sales volume is down, it’s vital to note that the car is the first try in the segment, which has been dominated by BMW and Mercedes (and lately, Audi as well) that have been established in it for roughly 3 decades. Give the ATS (or its CT# replacement) the same amount of time, and the same will likely take place for it. PS: “enough” is very subjective… but to me, it would be whatever amount necessary to make a profit. 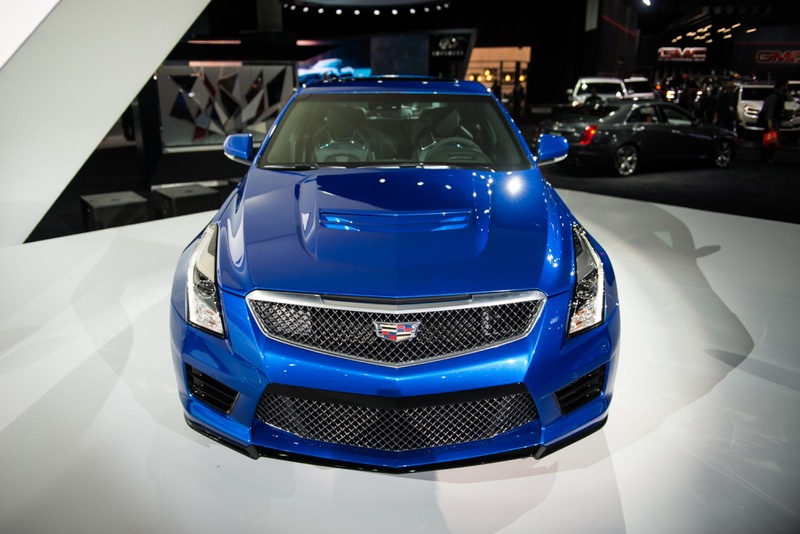 And Cadillac makes a profit on every ATS it sells. Obviously, though, there is (tons) of room for growth. 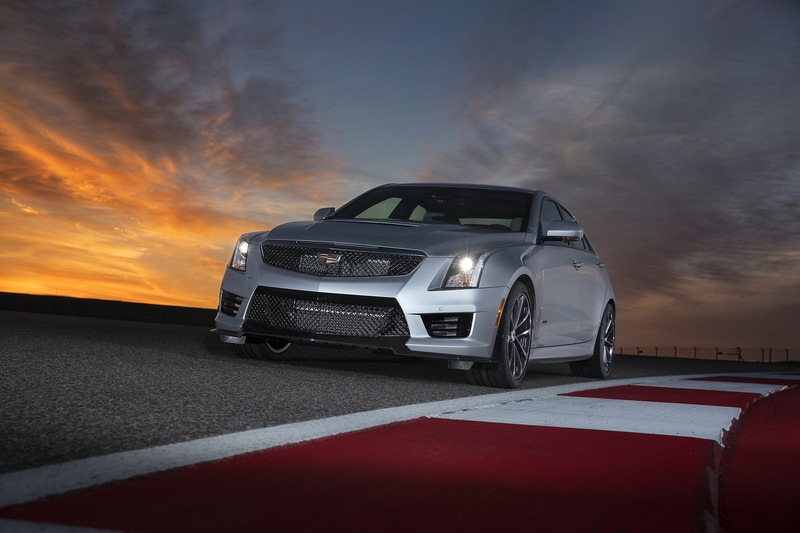 I agree with you that the ATS is a commendable first attempt by the fine folks at GM/Cadillac. 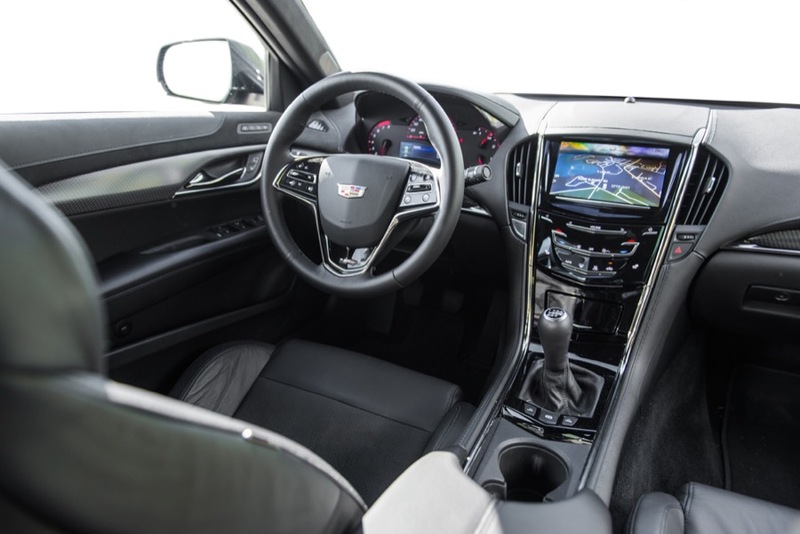 Also that I expect also that the 2nd generation ATS will be significantly improved over the first in a similar way that the 2nd gen. CTS was a vast improvement over the 1st. I do disagree however that sales success is inherent with a new vehicle launch and in fact ATS sales have steadily declined since the 2013 (first full year production). Alex, as you know generally most models have 2 years of sales volume success followed by a flattening of sales in years 3 and 4 wherein most manufacturers do a mid-cycle model refresh which buys them a little time before a full model redesign generally years 6 or 7. 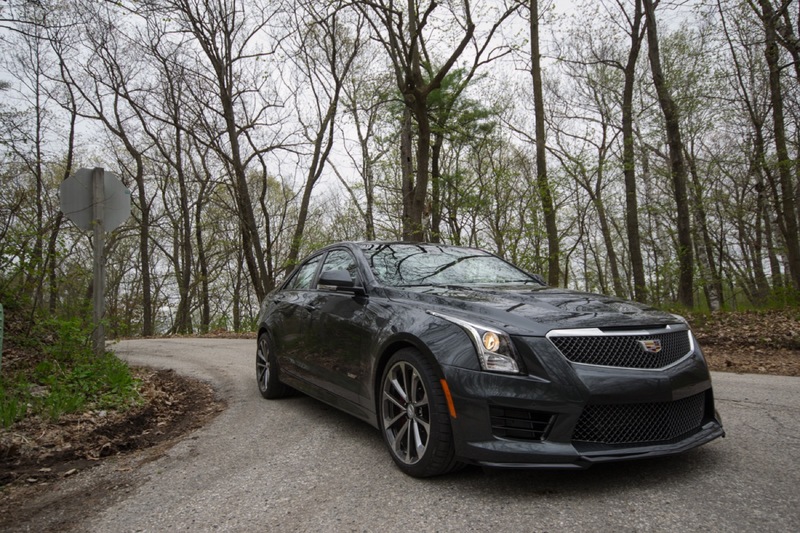 The ATS has not followed this usual model life cycle but I do believe that gen 2 will be more successful for a sales perspective. Enough is subjective but a YOY volume decrease every year since introduction is not. This is an unbelievable deal for those looking for a good deal, but it’s hard to not notice the other side to this story. 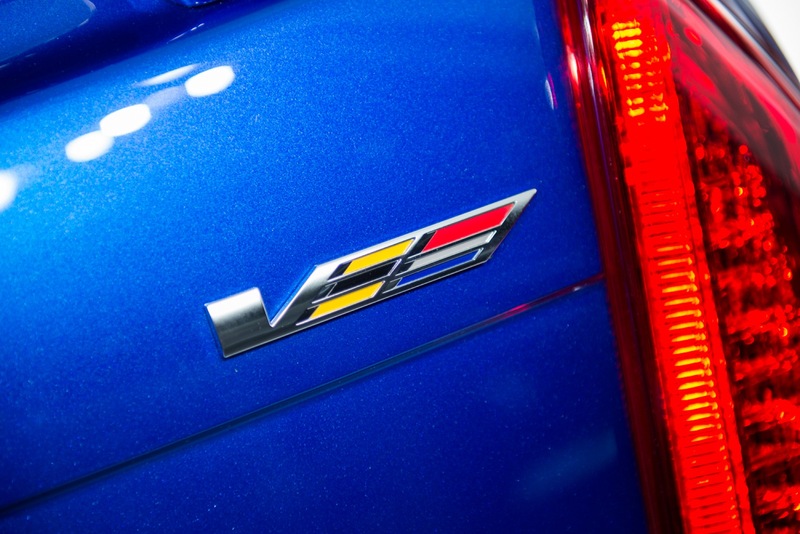 This is Cadillac admitting that sales of the ATS-V have been disappointing. I should want to buy this car because it is as good, or better than the competition, not just because it is cheaper. 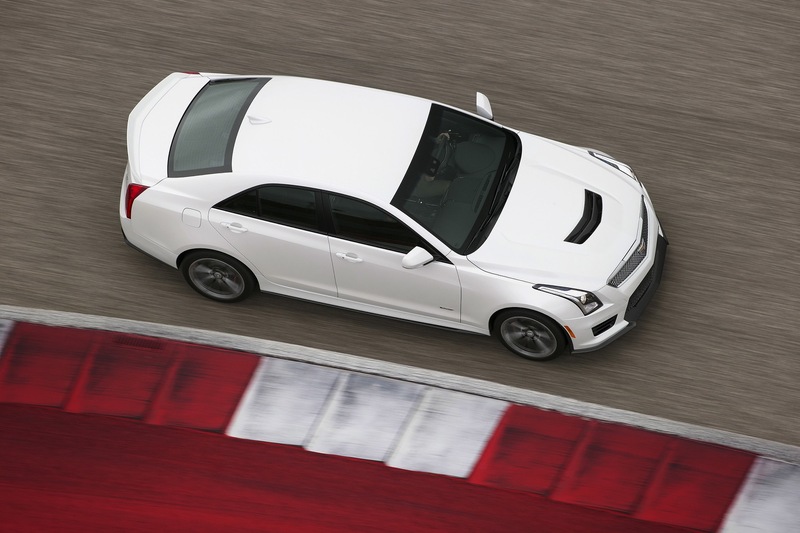 It’s a shame that GM can’t command a higher price for this car than what BMW is getting for their 340. 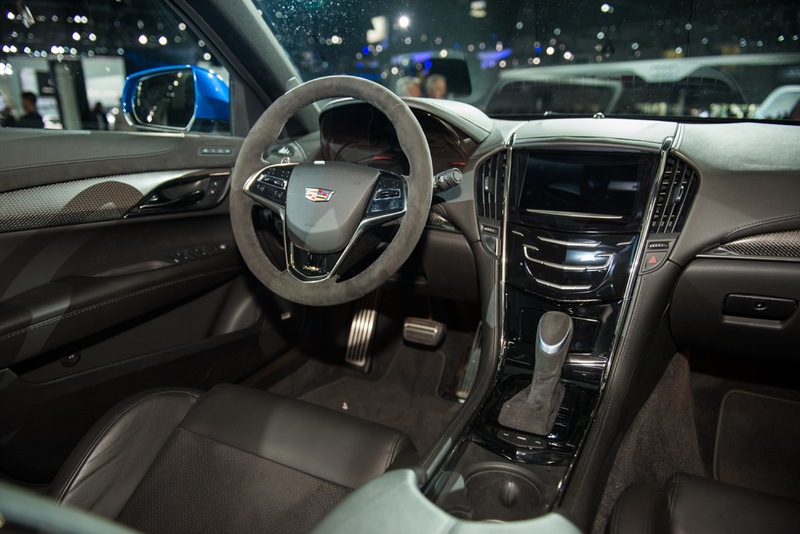 Part of the problem is that GM took too long to introduce the ATS-V, introducing it when the regular ATS is almost at the end of its cycle, so they had no chance to address the major flaws that dogged the ATS, particularly the perceived lack of premium interior. 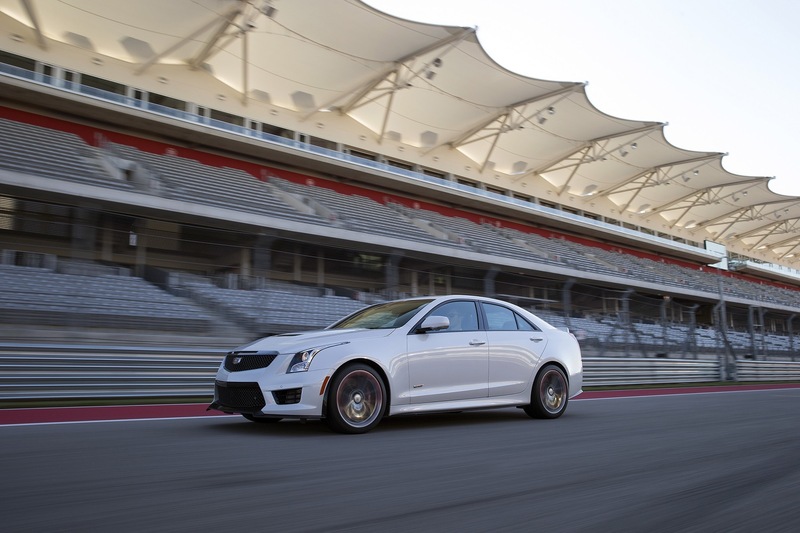 The general consensus is that the ATS and ATS-V have best in class chassis, but unfortunately, the remainder of the car seems to be behind the competition. 1. 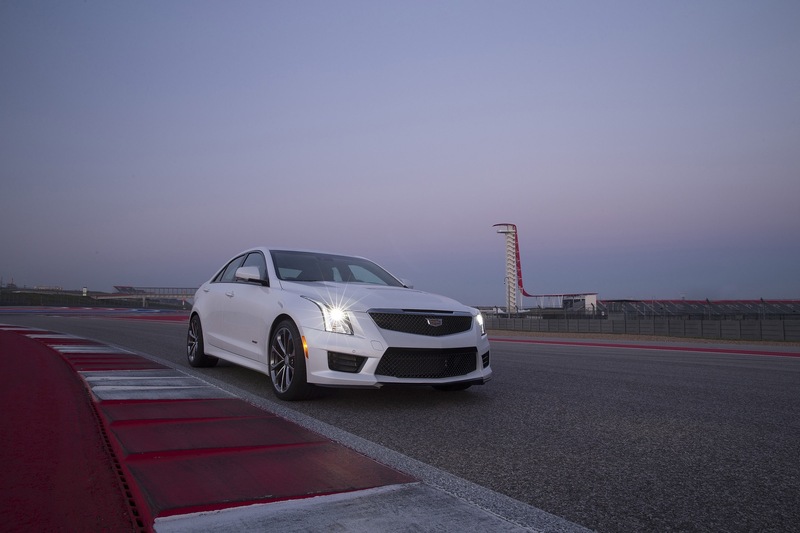 This deal appears to have been around since the second month of general availability of the ATS-V. It does not appear to be a reactionary move to slow or fast sales. 2. 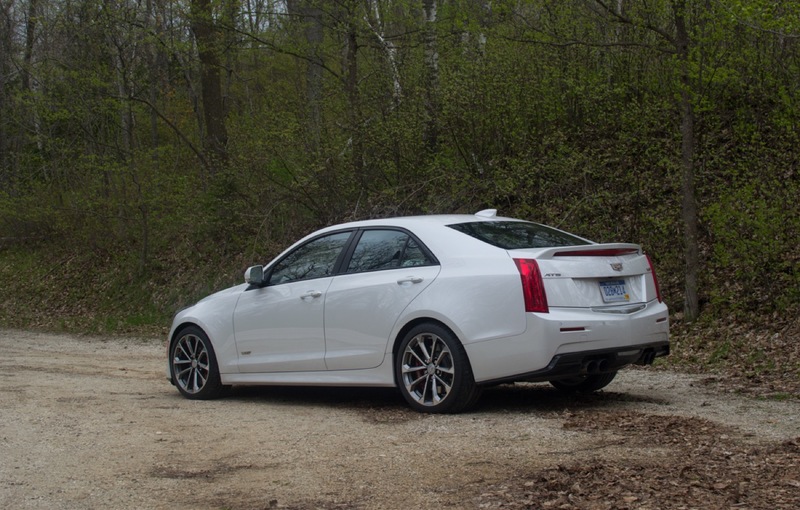 Cadillac has been more or less charging a few thousand less (or offering more features standard) than BMW and Mercedes for its vehicles, ATS and CTS (plus their variants) included. This is also the case for the new CT6, which is priced at a level that’s less than the 7er and S-Class. Let’s keep in mind that this car was developed during and throughout bankruptcy with very tight budgets. 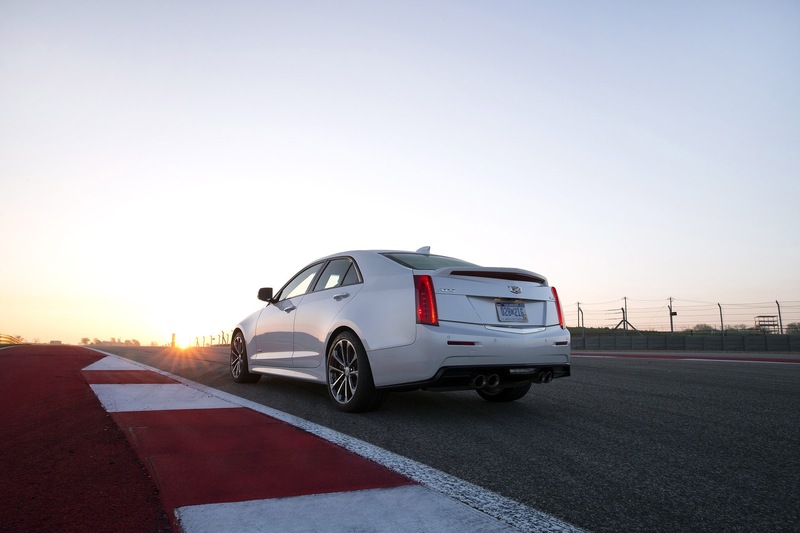 And for that, it is doing very well; heck, it has established Cadillac’s presence in the vital compact luxury space. I, personally, can’t wait to see what the replacement is, the one that is being developed with the $12B investment into the brand. 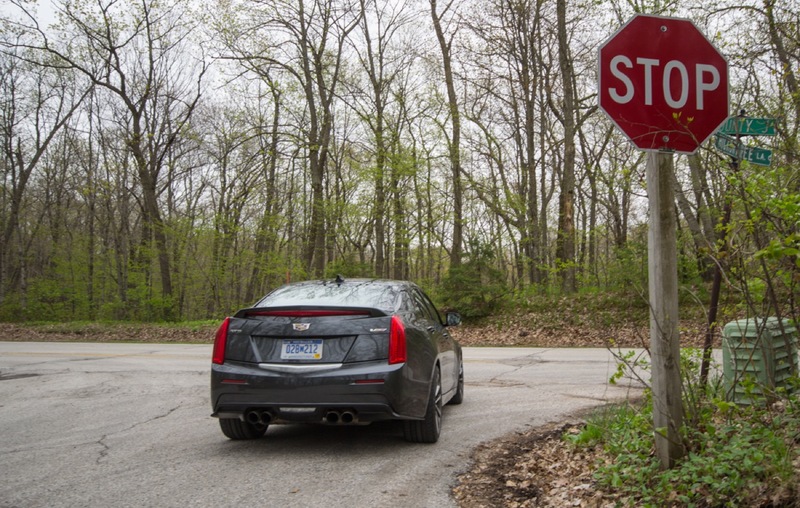 I do not think this is an admission of disappointing sales but rather just further illustrating a clear advantage that the ATS-V has over the M3. 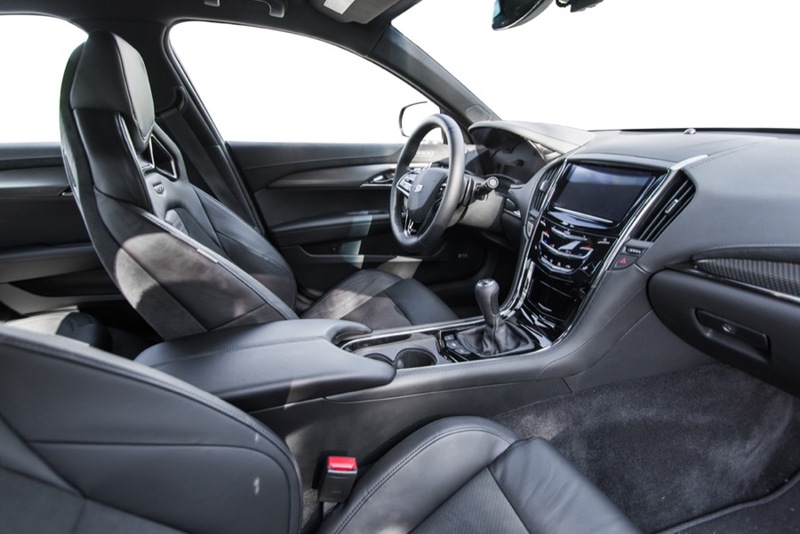 Leases are very important in this segment so offering a superior product (in many ways) at a superior value is just another way to strengthen the ATS in comparison to it’s competition. 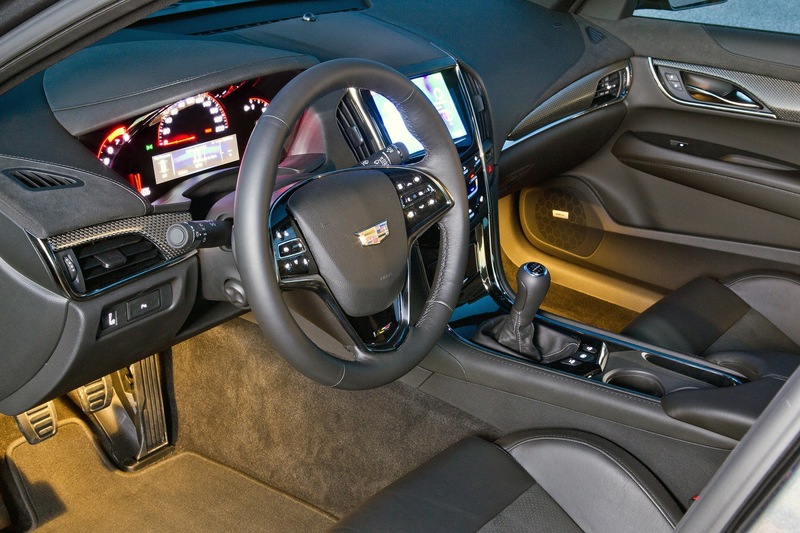 I agree that the ATS-V should have been out a year earlier but I do not think it is at the end of it’s product life cycle just yet. I see a completely new ATS in 2018 as a 2019 model which is 6 years on the market. If there is no refresh shown in 2016 (likely at the NYIAS) then expect the current vehicle (flaws and all) to soldier on until a full redesign. You certainly have drank the cool aid. How is it not an admission of disappointing sales? 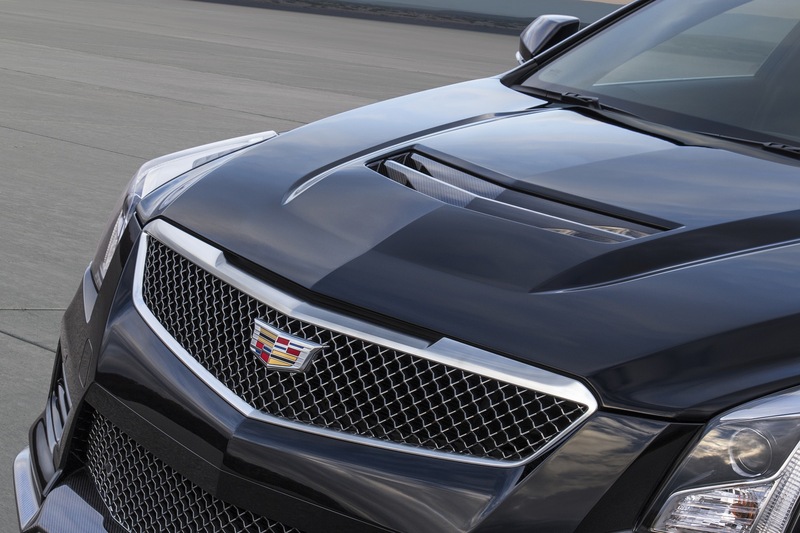 Why would Cadillac be essentially buying down these lease offers, at the expense of profits, if it wasn’t because of disappointing sales? 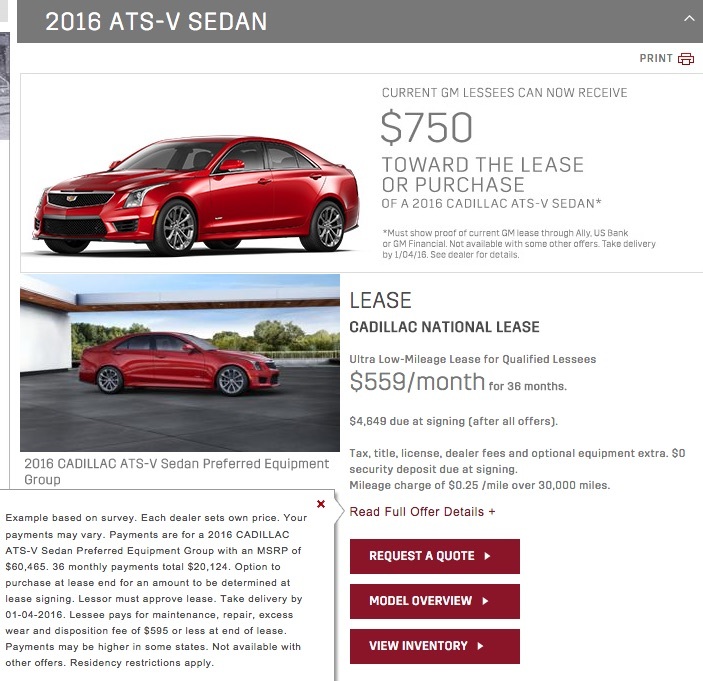 Do you realize that ATS sales are down almost 15%, YTD, and literally all other players in this segment have seen increases? Do you realize that the 3/4 series have outsold the ATS, in the US, by over 100,000 units, YTD? 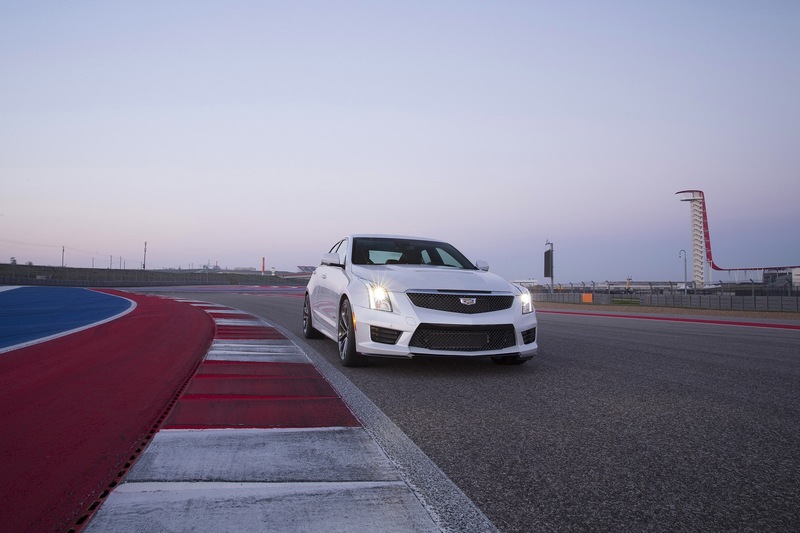 You can call it an advantage if you want, but the ATS-V is cheaper than the M3 because Cadillac knows it cannot get M3 money for the ATS-V. 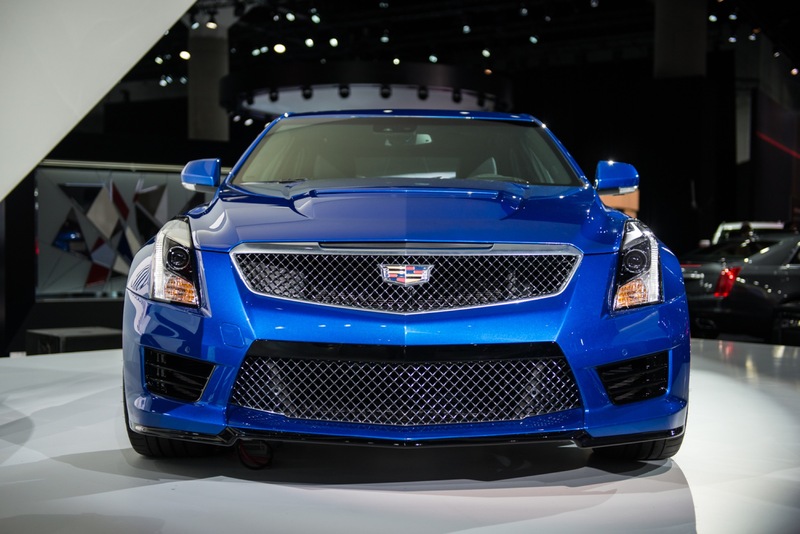 I am by no means rejoicing in this weak showing by Cadillac, I just call a spade a spade, I really wanted the ATS to do well, but it is a bad sign when you consider that the first full year on the market was the best year in sales for the ATS, with sales declining every year, it means GM needs to do a lot of work on this car, because this is the most important segment in the luxury car business, and the ATS is clearly not competitive. 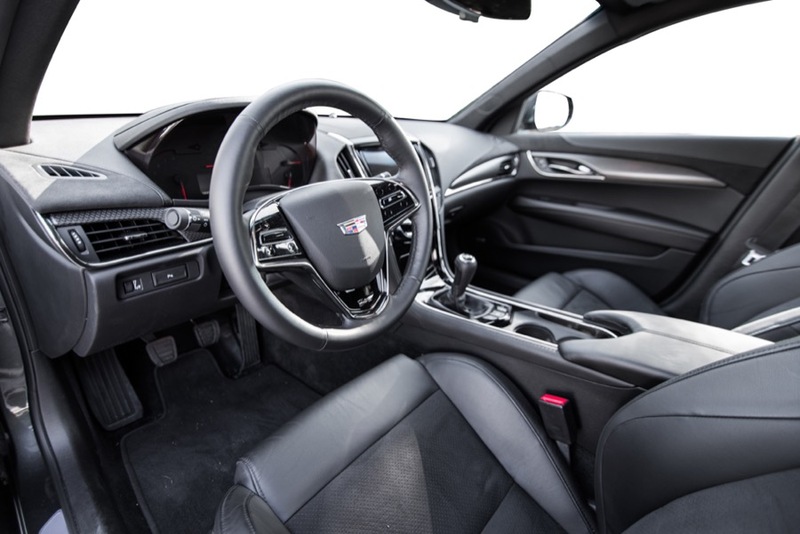 I like coolaid (spiked of course) but as Alex Luft pointed out that this particular lease promotion has been going on for almost as long as the ATS-V has been on the market so in and of itself not an admission of disappointing sales. Also if you read most of my posts you’ll see that I quote those same statistics that you mentioned above. 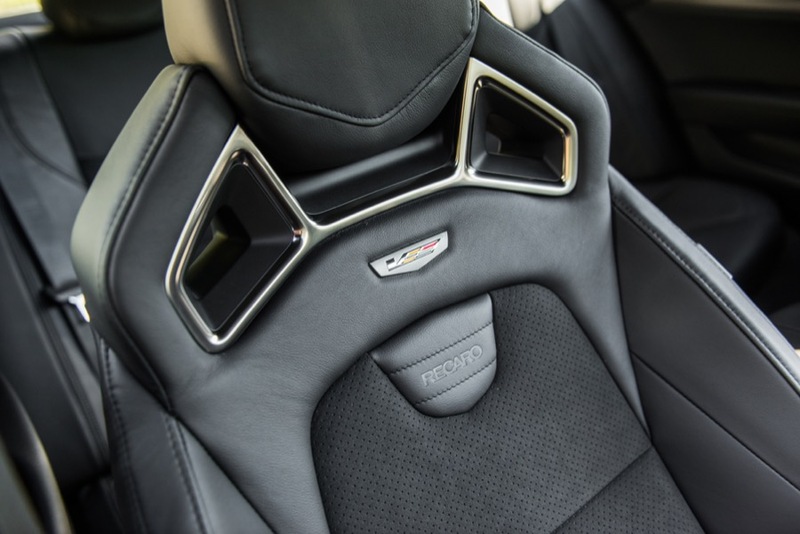 I like GM, Cadillac, in particular but not to the point of being delusional. Yes the 3/4 Series is the benchmark for the segment both in sales and ride/handling/performance categories as well. 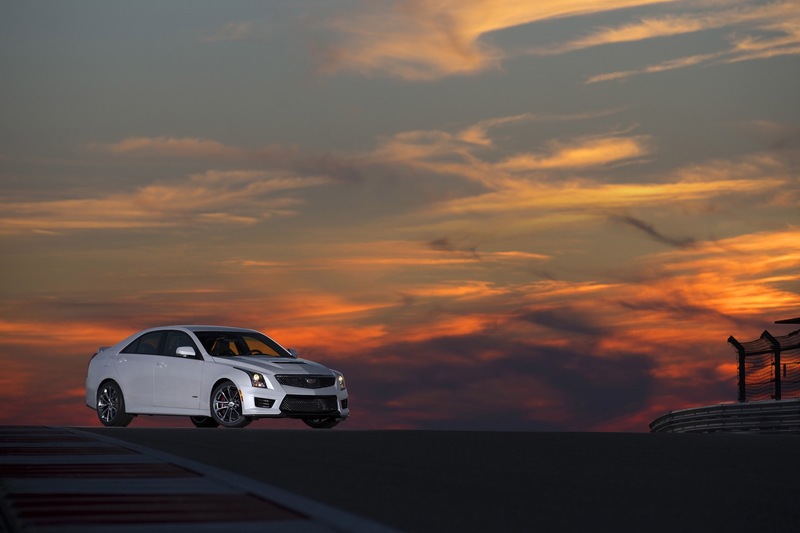 The ATS’s sales figures pale in comparison to those two and have a very long way yet to be competitive. Most of my comments end with the fact that for a first attempt they have done well and in all comparison test it competes right there with the established players in the segment. The other established players (C Class, A4, IS, Q50) competing against the BMW in the segment have been on the market years (many model generations) longer than the ATS and they are all far behind the 3/4 Series in sales. 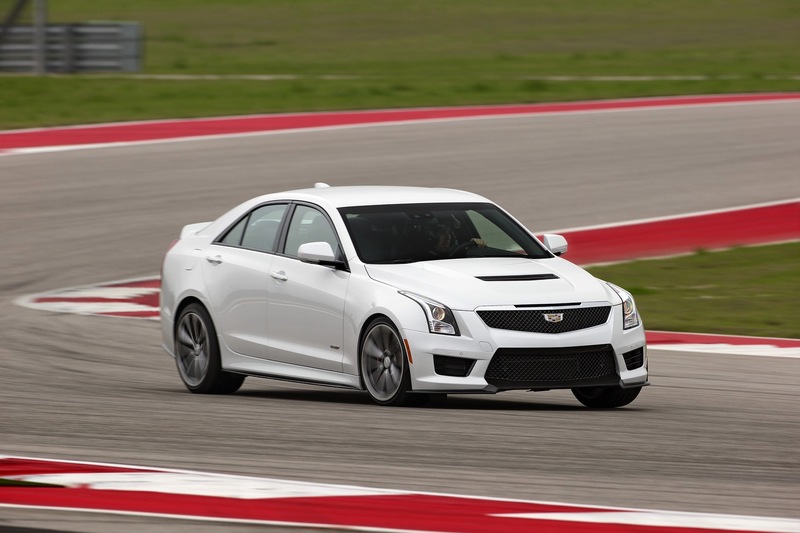 I agree that it is concerning that ATS sales have steadily declined. 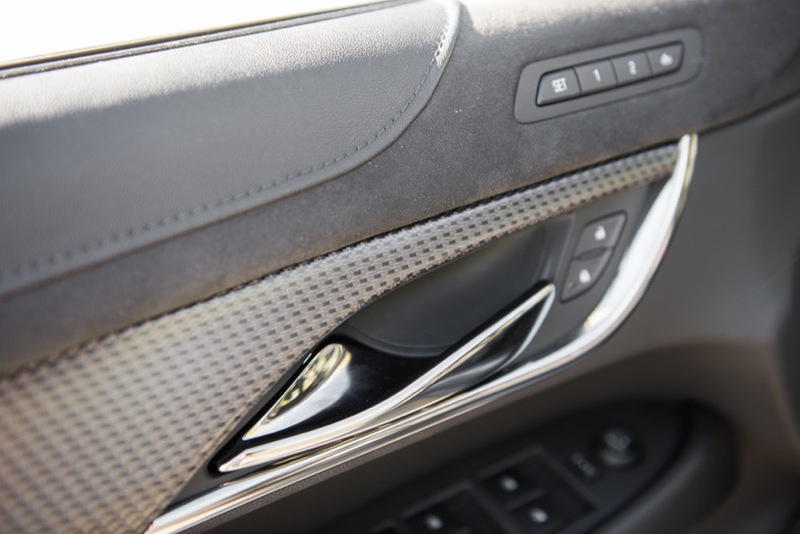 I agree that the Gen2 has to be just as class leading in the non performance areas ( interior design, ergonomics, exterior design, luxury feel, interior space, etc.) as in the performance measures. I do not agree that ATS is not competitive though. 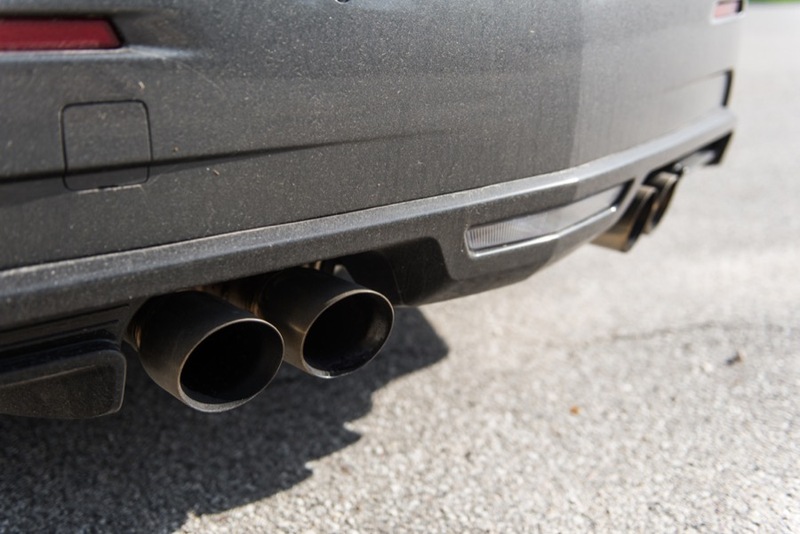 The 3 Series and C Class are stalwarts and it will take many years & model generations to make a significant impact in sales and have the ATS be an natural alternative to those vehicles in the minds of the buying public. 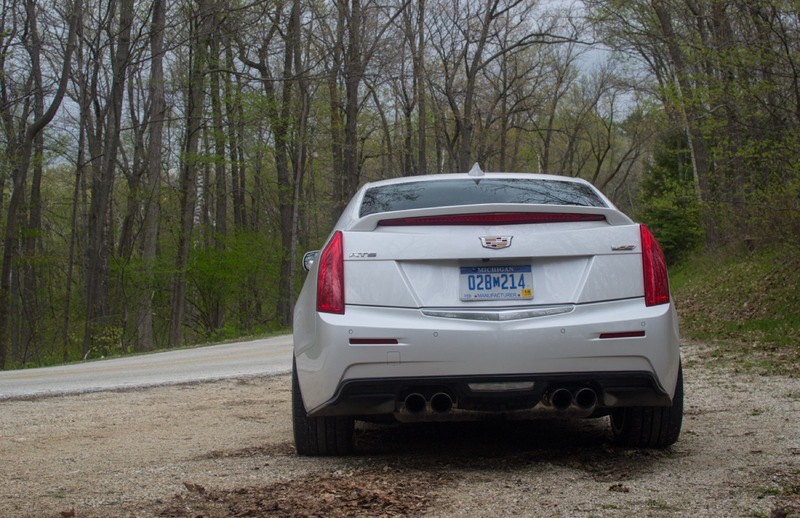 Hopefully Cadillac has the stomach for the journey because it is going to be a rough one. 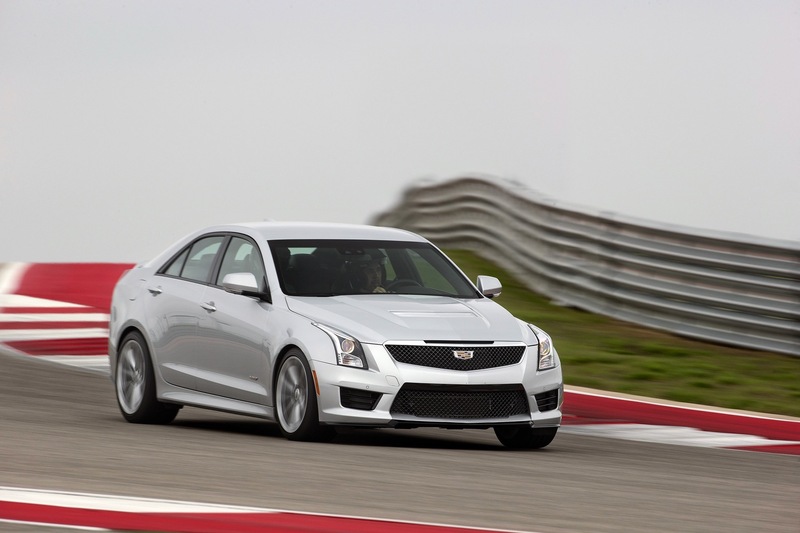 The ATS, even with the new 3.6 and 8 speed is still not in the same league as a 340i x drive. The 340i x drive does 0-60 in 4.6 seconds, the 328 is a much better performance comparison. The 328 is a direct rival to the ATS 2.0T. 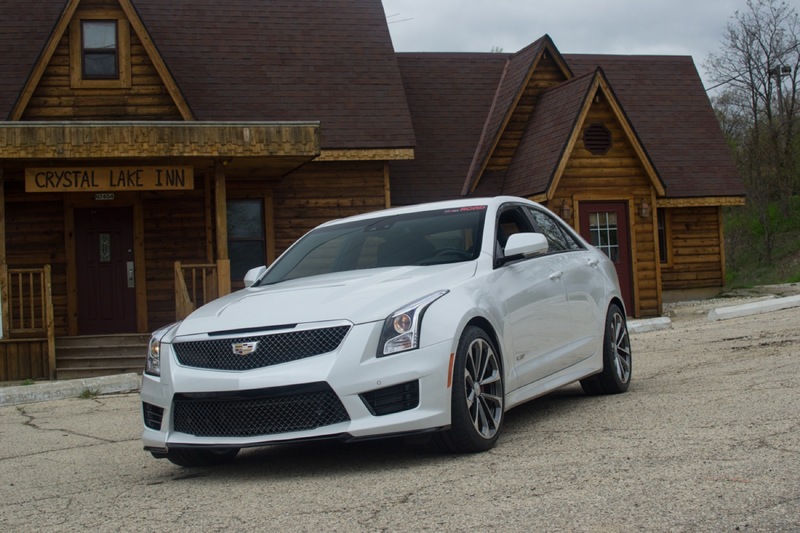 From a power AND performance standpoints, the ATS 3.6 is in fact the direct rival and is very much comparable to the 340, which replaced the 335 for the 2016 MY. Well, the C450 AMG and 350i are great cars but are priced above the ATS 3.6 as well. 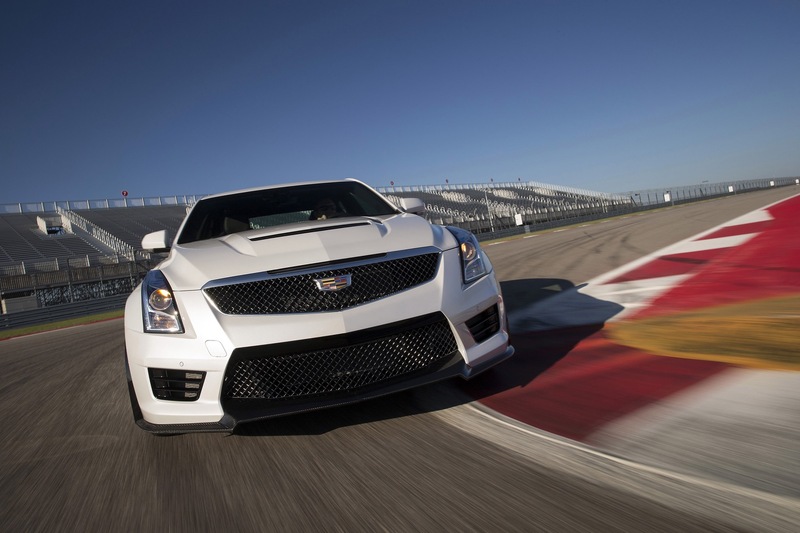 More than anything, your comment illustrates the need for the ATS V-Sport with the 3.0TT V6 LGW. 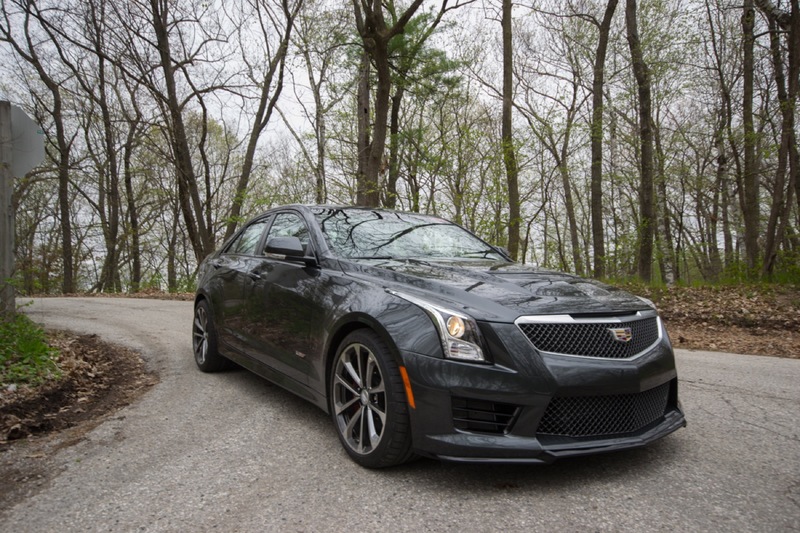 As it stands, the ATS 3.6 is a much closer rival to the Lexus IS350 and Infiniti Q50, with their naturally breathing sixes. 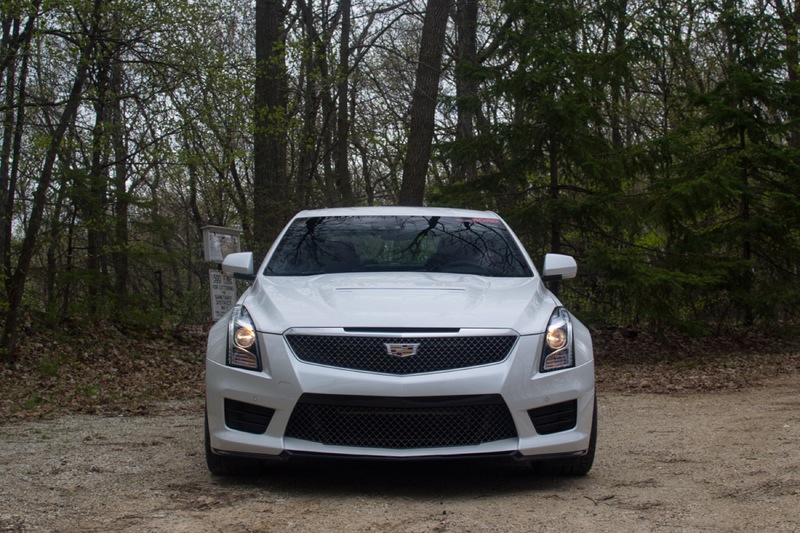 PS: I happen to own a 2015 ATS 2.0T. With the stick. 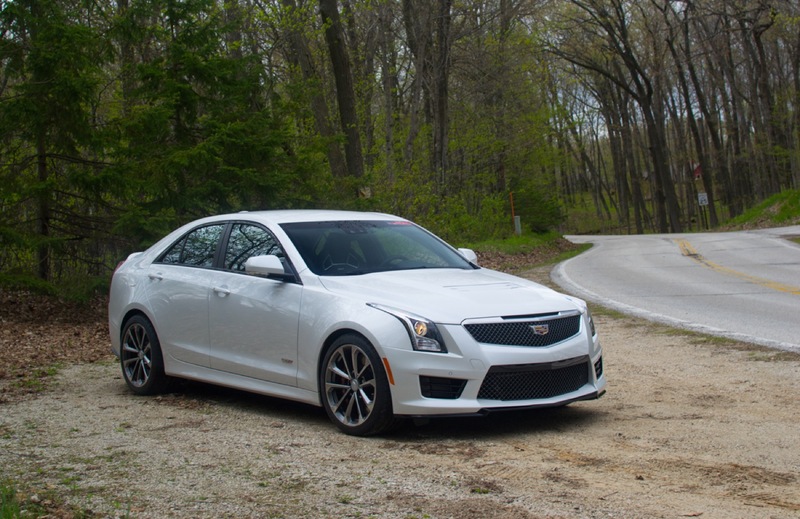 The 328 car and driver recently tested (granted with the track package w/ sticky tires) is faster to 60 mph and 1/4 mile than even the ’13-15 ATS with the 3.6 motor, so if the 328 is the direct rival to the 2.0T then caddy has a lot of work to do.